MixVibes has launched version 1.3 of its VFX Control digital video mixing solution for professional DJs and VJs. 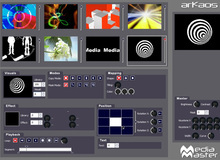 ArKaos, provider of technology for live visual performances, announces the release of GrandVJ 1.5, which includes new features and enhancements. Serato Audio Research has released Video-SL 1.1, a software plug-in for Scratch Live that adds the ability to playback and mix video files.